Professor Ed Adelson the University of Canterbury’s pro-vice-chancellor told staff at the College of Arts this week that the university will review American Studies (School of Humanities); Theatre and Film Studies (Centre for Fine Arts, Music, and Theatre); and the School of Music (Centre for Fine Arts, Music, and Theatre). Prof Adelson says it is the College’s intent that these reviews will not impinge upon students’ opportunities to progress this year through their courses of study. TEU national president Dr Sandra Grey says the broader question is the university’s commitment to the arts in Christchurch. Dr Grey says the people whose jobs are threatened by these reviews are people who have remained loyal and committed to the city. “Mr. Kelly believed that freedom was crucial, especially in research. Some of his scientists had so much autonomy that he was mostly unaware of their progress until years after he authorized their work.” – John Getner in theNew York Timeswriting about how to promote ‘true innovation’. 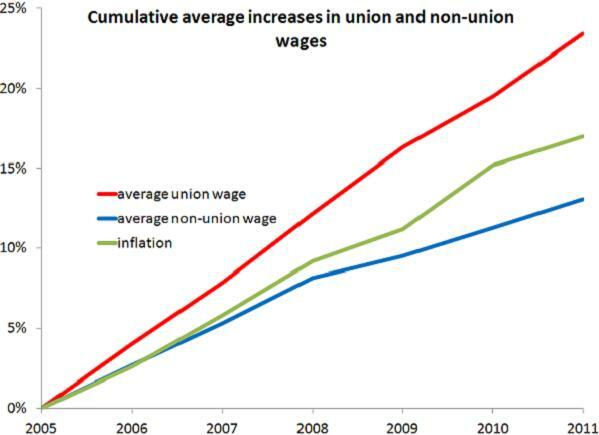 A graph showing average union pay-rises compared to non-union pay-rises and inflation, using data from the Labour Cost Index and the Department of Labour –the Standard. Port workers and their families explain in their own words how changes being promoted by management of the Auckland City owned Ports of Auckland will affect their families. Watch this video to find out what the Ports of Auckland dispute is really about.